Magic: the Gathering |OT| Ravnica Allegiance - These 5 Lands Will SHOCK You! I'm embarrassed to say I laughed out loud at that. There doesn't seem to be a point in having a top tier standard in paper right now, is there? At this point, I'm a little worried there might not a replacement for PPTQs or even Grand Prix Trials for a while. Funny, Alpha Investments is one of the 9 content creators they have as an option for "what Podcasts/Livestreams/Youtubers do you watch"
Is there a budget alternative to Hydroid Krasis in standard? The gates deck accepts pretty much any high-costed finisher, be it Krasis, Expansion/Explosion or any other big creature. Krasis is ideal, but not nearly the only option. I ran up against a guy who was playing five color gates and had Nicol Bolas as his expensive finisher. I wouldn’t call it optimal, but part of the appeal of the Gates deck is that the ramp package paired with Gates Ablaze, Guild Summit, and Gatebreaker Ram is powerful enough that’s it pretty much lets you play whatever splashy expensive finisher you happen to own already. Just got back into magic after selling all my cards 25 years ago -_- Friend made me a deck for Christmas and it sucked me right back in. I'm a strictly paper magic player as I'm a console pleb so I'm with the paper players!!! :) I got excited and bought 3 Mythic Edition Ravnica so now I'm just sitting on two looking silly. But I do love the fancy foils and mythic cards now. So many cards to catch up on, feeling overwhelmed at times. Haha well that's certainly an interesting way to jump in. If you're willing to spend that kind of money, you should probably just look into jumping straight into Commander. It's the format that got me back in. What would you recommend ? I'm playing the green, blue, red + splash white variant. I have a Biogenic Ooze, a Goreclaw and a Ravaging Wurm since that was the spare stuff I had in my binder, but I've seen people using Ghalta, Etali, Carnage Tyrant and similar stuff. Oh I should have one or 2 biogenic oozes laying around for my ascendance deck, might use that meanwhile! After a bit of messing around with Omnitell in Legacy, I think the deck just might not be for me. I am going to build out UG Infect and see if I like it better. Played a bunch of Judith + Priest of the Forgotten Gods Rakdos aggro last night. Love this deck. Played a match against mono-red (not the burn version) where I got to just pick off their creatures with 1 damage pings sacrificing Footlight Fiends and Gutterbones. It's just good clean fun. I mean they are doing a pre-release at the London GP so i guess it effects the people in that area. Also note for the price of playing at the GP you could probably do three pre-releases at a LGS so I doubt they will be a ghost town. And with GP main events really not meaning anything anymore, having multiple flights of a pre-release is probably a way more interesting thing than a GP main event? I think some of the problems here are unique to the UK and lack of communication leading up to this specific occurrence. Things can probably be adjusted to satisfy all parties, but as is big pre release events will totally hurt the surrounding game stores. As much as I think LGSs aren't nearly as important to the game as they used to be, disturbing the current pre release structure seems ill advised. I'm enjoying it. My surprise all-star has been Legion Warboss. The must-attack token plus Gutterbones gives a great sac engine (you basically have to spend the mana on immediately rebuying Gutterbones since it's going to fade at the end of combat, though), it at least tends to leave a token behind if mono-red burns it off the board, and it gets some must-answer pressure onto the control decks without committing anything extra to the board. Kind of uncertain what (if anything) to do with my 4-drops, though. Right now I'm running 2 Rekindling Phoenixes and I've played around with Ravenous Chupacabra, but I feel like I almost want something else at 2-drop instead. Now that I figured out ranked matches weren't the BO3 until they added it, I've been paying and ranking up in BO3. I've been playing an inverted sort of BUG Rock list with Thieves of Sanity mainboarded (and a couple Vraska and a single Findbroker) and the Wildgrowth Walkers sideboarded. Not much burn on BO3 so I've not missed them in game one and it's been nice for upping my previously poor winrate against a number of decks game one before tilting further my way with SB. Mirror gets lopsided. It's slower for sure but that's not been a killer given its a lot of slower decks. I do wish Arena had more to offer besides ladder at the moment. Can just ban it on arena. Awesome. That card was a mistake. They want to keep bo3 as an accurate mirror of the paper format so that people can test paper Standard on Arena. Seems smart/correct to give players the option. Dang nice, AND they're giving anyone who owned copies mythic rare wildcards. Separate ban lists is going down a dodgy road that could really come back to bite them if they're not careful. If they don't think people can be trusted to understand sideboards how is this not confusing? Understanding a card is (universally or conditionally) banned is ultra simple and has been done for ages in Magic and for a while in Hearthstone. A) Digital vs. physical is unique because in real life an infinite do-nothing loop does nothing, and online it at best might end the game after 30 minutes of pure solitaire, and at worst is an active exploit where someone who would lose prevents the game from ever ending for either player, gambling that the other player will simply disconnect after 45 minutes. B) Best of 3 takes forever, and even single games take a long time, and nexus makes both of these longer. There are a substantial number of people who would prefer to move on to a new opponent and new enemy deck. C) At least two colors have literally no way to remove enchantments that I am aware of, sideboard or not, and thus cannot prevent the infinite "I can't win, but I choose to waste both our day's rather than concede" exploit. They thought about it, checked the data, discussed it carefully, and explained the rationale on the website. It was done carefully and generously since people who want to use it can still do so, and everyone gets wildcards who might have even possibly messed with the card, even if they were using the exploit. It's easy to understand a card being banned in a digital format because you just can't put it in a deck. There are a lot of rules that are no longer hard for players to understand when Comrade Computer can just say NO. This actually just got me thinking: what's the ruling in physical if someone is just doing infinite stalling? I'd imagine nobody would play a zero wincon deck in paper, mind, but say, they could lose their wincons over the course of the match before going infinite or something. Is it just a loss like it probably should be because they can do nothing but stall forever? You call the judge over, the judge looks and says "since it's an infinite loop, you just declare how many times it's executing and fast-forward to the end." The player then declares, for example, that they're doing the loop 1,000,000,000 times, and then you continue the game. What should also be bannable are the macros (? I forgot the terminology for this) that let players just sip on their coffee while whatever program they're running does the whole Nexus of Fate loop for them. If you're going to waste everyone else's time, you need to actually do the actions. Also, the revealed card window is such a PITA against Nexus. I alt-tab to surf the web until I get priority again, never see my window flashing, and alt-tab back just to see that my game state is frozen behind "Revealed Card: Nexus of Fate". So dumb. I have to alt-tab every few minutes just to clear my screen so my game can catch up to whatever's actually going on. To expand upon this: if you have nowhere to go with the game once the loop is over, the judge will issue a loss for failure to advance the game state. This doesn't really happen much because most demonstrated loops resolve into victory, but in the rare instance where someone's looping without purpose that can be grounds for a game loss. I think this is a good way to ban the card for it's problems in a Bo1 digital format, which was really all that's needed. I would say for all other formats the card doesn't need to be banned as it's easily dealt with in a Sideboarding situation and nobody really gets upset casually playing kitchen table Magic. If it were to be touched on Paper and Digital Bo3, I'd like them to dust off Restricted for Standard and force the card to be a 1-of. Here's the announcement, with more details. Nexus of Fate hasn't actually been causing much trouble in paper, from what I hear, so I don't think it will actually be banned in Standard or Arena BO3. Nexus of Fate isn't in the upcoming Challenger Decks. Of course it's not in the Challenger Decks. The only (true) reason it's not banned in Bo3 is because they would completely burn those players who paid 100$ for a box to get a copy. This is also the reason why they won't put it in any other product because it would completely diminish the purpose of BaB. Guys, what should I be buying in terms of binder pages for my extra cards? Bonus points if I can just place them nicely in there without needing more sleeves, as it's not going to be anything super valuable. Just the stuff I bought sort of to have (angels and merfolk I liked the look of mostly), my cards for Commander I currently rotated out of the deck, and probably the random rares and junk I've picked up from prereleases and stuff. And don't want stuff sliding out like crazy, ideally. Also, what sleeves should I grab? Got Ultra Pro non-matte in blue and red as those seemed readily available and had good reviews, but the rest of the colors out there all seem to be matte which people don't seem to like. Still have like 3 new commander decks to sleeve from my recent splurge and I want them all to have unique colors going on to differentiate. I like Dragon Shield Mattes for sleeves. I vastly prefer the texture of matte. They have non-matte too. Dragon Shield has consistently the best quality and the sleeves will hold up for a decade. 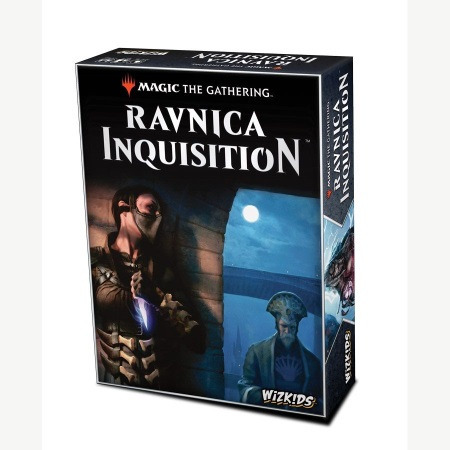 From the Toy Fair, MTG: Ravnica Inquisition. It's one of those Werewolf / Resistance social deduction games where you represent a guild that may or may not be working for Bolas. Seconding this. If the cards are rare or valuable and you can justify the price, Dragon Shield black mattes are outstanding. The Challenger Decks are pointless anyways because paper Standard is dead and buried in my area. Thanks guys, gonna try out the Dragon Shields. Got everything nice and color coded, actually, so this should make for a pretty nice setup. Pewdiepie is playing Arena now and he's already diamond rank. Maybe he'll be one of the top 8 invited to that tournament thing. I think I'm gonna be sick. Legit will boycott anything he’s involved in so... nope. I really hope they print some key cards in the Challenger decks, I would definitely like to see cards like Teferi or Krasis drop in price. The money cards in the previous decks were all cards that rotated in the fall. 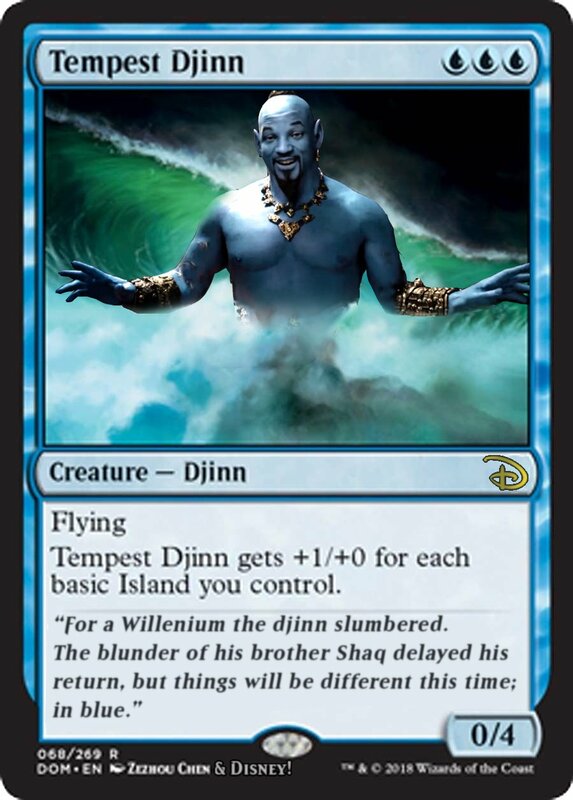 So, Teferi might happen, but there's no way Krasis will be in there.